What do you do when the power goes out just before you are pronounced husband and wife on your wedding day? Well, you continue with the ceremony and reception, by candlelight, until the lights come back on. What an event to remember! 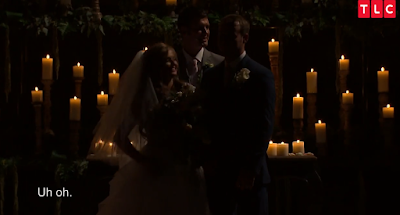 If you missed last night's season finale episode, featuring Joseph Duggar and Kendra Caldwell's wedding, click here to read our recap, and check out the video clip below, courtesy of People.com and TLC. I loved this episode!! It was so sweet. I wish only good for this couple. Two sweet God fearing people, I love love love counting on. it happened so perfectly timed that it seemed like it was supposed to be! the candles were absolutely beautiful in the church without the lights on. what a great story to pass down! Good thing they had all those candles! I'll bet it was beautiful in person. They had food at their reception. At 1:47 in the clip, it shows a nice assortment of hot and cold foods. Very nice. It was probably Kendra's family that made the decision about that. Bravo!!! Very respectful to feed your guests who have, in some cases, travelled quite a distance to be there. I agree. I still find it hilarious that Jeremy told Jinger they weren't going to have a huge tacky wedding and then that's exactly what happened. Funny, I don't recall Jeremy using the word "tacky," and neither was his wedding tacky. Interesting spin you put on things. It was a weird comment Kendra made: "the best kiss ever." as compared to what other kiss? Well...it was the best kiss she's ever had. Nothing wrong with saying so! Maybe the first kiss at the very moment of being wed will always be thought of as 'the best'! No other kiss. It's just an expression. I assume she's been kissed by her parents, grandparents, etc. It was a sweet comment. Yeah I found that funny too but since she was so nervous, i’d give her a break. So glad this show is on. So glad Josh wasn’t seen. Wish the new couple nothing but the best. Hope Jana finds someone soon. She is adorable . TLC did some pretty dancing editing!! I'm glad the family is finally showing Josh and Anna and their family again. If honey boo boo can come back allowed by tlc- with the mother who allowed her childs abuser back in the house, then Josh should be allowed back too. Haters- watch it or don't but stop crying, it's getting boring. I'm glad the show is showing Josh and Anna and their kids I enjoy watching ALL the Duggar's. Just remember, when you sin,sin is sin in the eyes of God. Even if you tell a small fib,if you are ever jealous or envious of someone, you are still sinning no matter the size of the sin in your eyes. If you hold a grudge against someone and treat that person badly,yet go to God in prayer, God tells us to forgive that person we have an issue with before we go to God in prayer! Because in God's eyes, your sin or mine is no different than any other sin like what Josh did or doing worse. PS.. Jana is very likely happy being single and maybe she is not even looking for a spouse at the moment. I agree that she is a sweet young woman. All the Duggar women are, including Anna and Michelle and Grandma Mary! Is the abuser guy from Honey Boo Boo back on the show? Genuinely asking, because that would be the comparison here. I don't think it was on any longer than showing June lose weight for her ex's wedding. Josh is a Duggar and part of their family. He is forgiven in God’s eyes and his families. He did nothing to any of you who make ugly comments. Extend a little forgiveness and allow the past to fade....who knows perhaps the show could include more of the family if people let go of this. I've watched Joe & Kendra's wedding twice - did not see any of the Bates Family - As it is the bride's family which send invitations I wonder if they were included. ???? I hope that Joe and Kendra make a pregnancy announcement soon! And Jessa and Ben too! Why? Jessa already has two kids and Kendra is only 19. There's more to life than having babies. Ben and Jessa seem to be struggling with two under two at the moment. I think a third right now might be too much. She seems to be enjoying spending quality time with her two boys. Yikes! I just saw a nice wedding that's all! You know, I love wedding and baby stories, but even I am really wanting to hear other things about the family. I agree. I love that this family loves children and it seems that the married kids are eager to have a lot of children of their own, except for Jinger. I hope that she is pregnant soon too! 3:19- People are allowed to change their minds about the number of children they wish to have, especially once they already have one or two. Also, maybe Jinger and her husband aren't ready to have kids yet. I wouldn't wish something for someone if that wasn't their desire. You simply have no way of knowing for sure. I only hope that these girls are pregnant if they want to be.....not because any of you “hope” they are pregnant. Having 19-20 kids is not for everyone. The Duggar ladies should not feel guilty for having only 1 or 2. They always say it is God's Will so they should just let it be so. I pray the show continues. Lives are perfect, but I so enjoy watching how you all make imperfected events into good lessons learned. We all need to see and learn. Thank you so much for sharing how God works in each of your lives because you allow Him to guide youand you follow the Bible and live it!!!! I typically record this show so I can watch it when my son is at school. However, it DID NOT RECORD! How can I see it now? Unfortunately, there are not currently any reruns scheduled. Since you have TV service, you should be able to watch the show on the TLC Go app/website. You can also purchase it from Amazon or iTunes. Come to Australia.. all our provider @foxtel give us is re-runs.. I thought the timing was perfect too! So cool to walk out by candlelight! And I don't know if all the bouquets were Cindy's last minute creations or not but they were gorgeous they way they cascaded down as the girls held them! So pretty and unique! Loved how they handled it with such ease! Ms Cindy always does a great job. Handy as they might have been, I thought all those candles were a fire hazard. I'm surprised the church allowed them. And the cost! That many candles and the holders are not cheap! Retail prices may not be cheap, but you'd be surprised how much you can save when you plan ahead and put some effort into it. How much time do you think they have to "plan ahead" with these super-short engagements? 3:39 Have you ever watched their show? Ever read their books? They are constantly keeping an eye out for things being sold at rock-bottom prices. If there's a good chance they could use it now or in the future, they buy it now. When they need those items later on, they don't have to rush out and spend top dollar. The Duggars have a lot of party decorations that they buy on sale and then use over and over again. This has been discussed on their show at least once - perhaps even more. Just to clarify, I don't know how much they spent on the candle holders, or whether they simply borrowed them from the church. I was just responding to a post that looked to me as though someone was desperate to find something - anything - to criticize. Inexpensive stock candles were used and can be purchased by the case. Candles are a great choice to save. I thought all the lighting and camera equipment there blew a circuit breaker. I've never seen an area-wide power outage be fixed so fast. I live in the same region as the Duggars and, when our power goes out, it is usually back on within seconds or minutes. There have been natural disasters which caused long-term outages, but those are relatively rare. Most systems are automated to try to restore power, but if it blinks out once or twice and then still goes out, it's usually out until someone is dispatched to the problem or the substation. That usually takes an hour or more for restoration. Who knows how long the power was really out on the show. They could have edited the daylights out of it. Kendra seemed to take all the glitches in stride: Joe's broom ball gash, her mom's dress ruffled separating from her dress, her ordered flowers not arriving, the surprise guy dropping from the ceiling with her ring and the lights going out!! She kept her pretty smile and giggle going!!! Kendra came off as a very compassionate, kind, sweet leveled headed young woman. I'd love to meet her and just talk. Joy was looking very pregnant. Yes, seems to be carrying large like her sister Jill. It seems for a moment God did His own stunt to awe everyone and make the occaision memorable! Yes, if God has a sense of humor, we can too. I loved it when the lights went out. The timing was amazing and the candle light was gorgeous! I loved the ceremony and this entire episode of counting on. Joe and Kendra were so cute up there. They really seemed to bring out the best in each other. Good thing the lights didn't go out before the couple shared their first kiss. Okay I know it's not a competition but I'll just make a fun little list of the dresses. IMO from most beautiful to beautiful. Another thing: I keep seeing comments on here about people who think Kendra seems so immature. Let me remind you of a sweet 20 year old Ana. Kendra reminds me of Ana. I think it's just that they are so in love and a little shy that they come across as immature. Ana flourished into an amazing wife and mother. I'm sure we'll get to see the same happen with Kendra. Oh and Erin Bates is another great example. I agree with your order from most beautiful dress at #1 to beautiful at #6. Gee, I sure hope sweet Anna doesn't see your just for fun list. I agree with one change - I like Jill's dress MUCH more than Jessa. . . .Jessa looked like she was going to a prom. Hands down Jinger's was the most elegant. . . . And fit her perfectly. Lily and Ellie, is it true that Jana is courting Caleb Williams? I hope they do an episode showing Joe and Kendra's new home. Wondering why where they live matters, could not help myself but to ask. I'm sure it doesn't matter. However, I enjoy seeing people's houses, as unknown must too. Joe referenced being next door a couple of times? Beautiful dress and wedding. Very happy for them both. But, Ellie were you at the wedding? I would like to know if there is anlot more to the ceremony than what they show on TLC. For a Bible believing couple there were no Scripture readings from the Bible or Spiritual messages given in the ceremony. Kendra's dad gave his personal message but no sermonette or Biblical message to the bride and groom? Everything focused around the first kiss. Seemed like something very important was missing! I was wondering the same. Also - do couples in America choose a bible verse like you do for baptism e.g.? In Germany the sermon would be about it in most cases. Johanna, hello to you from the U.S. :) I don't think we do as a rule, but some probably do. Our wedding was in the Catholic Church and of course, complete with a full Mass including Communion (or a blessing for those not receiving Communion). The Duggar Family must do a full religious service as well, but they just don't show it on TV? Every wedding is different. It's normally up to the bride and groom . For my wedding, my preacher preached a little message about salvation upon our request. We had family that weren't Christians at the wedding. Not all weddings have weddings. But I think it's important to have Bible verses or something. For our wedding, our Pastor did a little teaching woven throughout our ceremony about what a marriage actually is designed to be by God-how the husband and wife are uniquely created by God with individual gifts that complement (not compete with) each other, that each is a gift to the other from God, and we're not intended to "complete each other". It is God who completes us (fulfills us), so that we're able to love one another rightly. See their kiss was soooooo powerful, it sorted out the power, LOL!!!!! Love the wedding, and Kendra's dress was kind of like Jessa's!!!! I love them both!!!!!!! !